I love craft sticks, and so does my good friend Katie from The Homespun Hydrangea. 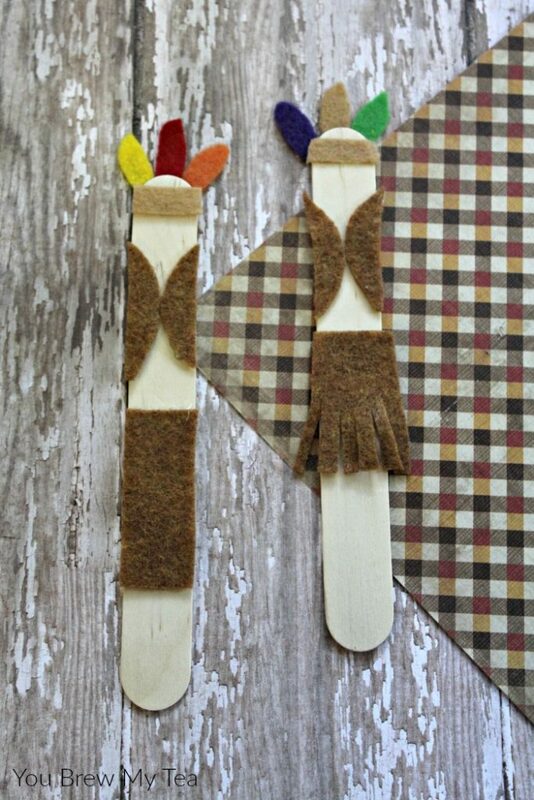 So, this fun Wooden Craft Sticks Native American Kids Craft idea is a craft I love that she made for us. She has such fun ideas and always does a better job than me at making them. This idea is perfect for fall and Thanksgiving themed projects! 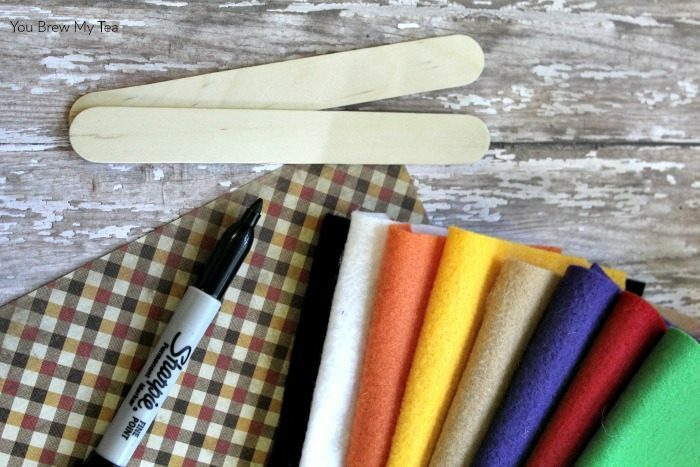 Craft sticks are one of the most affordable items to add to your craft closet. 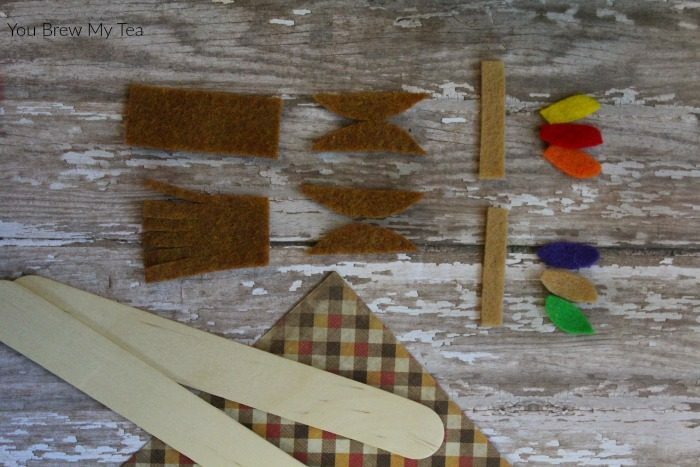 Along with the felt, you will use some glue, and scissors, to create these fun decorations. They are perfect for use in homeschool lessons, or to use and create a doll that can be used for telling stories. 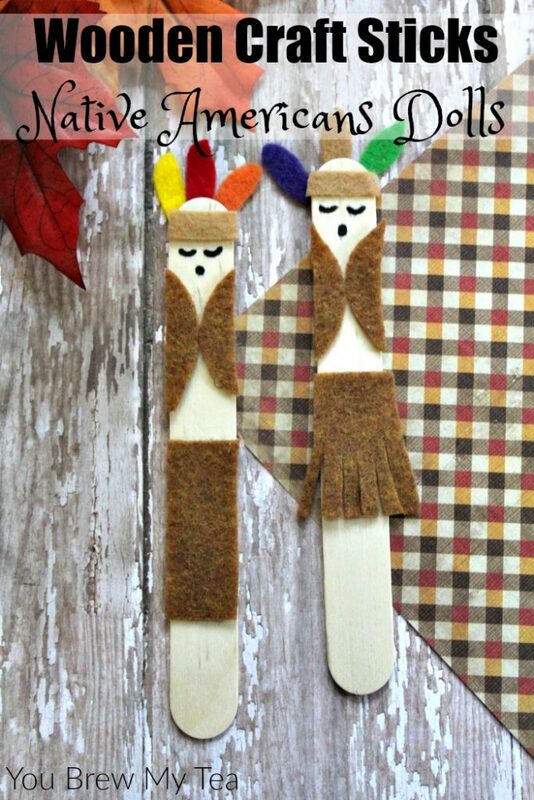 Wooden craft sticks make Native American dolls that are perfect for going alongside a great Thanksgiving themed homeschool unit study. We love using a simple craft, some worksheets, and a few books to create a unit study that focuses on learning in multiple ways about one singular topic. It makes it much easier for kids to retain the information long term and holds their attention. 1. Begin by cutting out the head dress for the Native American dolls. A small tan strip and 3 colorful ovals per doll works well. 2. Create vests for each Native American by cutting out two brown half circles per Indian. 3. For the bottoms, you can create a fringed skirt by cutting a simple triangle and flattening the pointy end and fringing the opposite end. For pants, a simple rectangle will do. Use brown felt for both. 4. Start gluing the clothing and head dresses into place. Your hot glue will work well at keeping it adhered. 5. Now add a face on each Indian by using a black marker. Just make some gentle curves for closed eyes and a dot for the mouth. Note: One thing I want to share is that I wavered between calling these Indians and calling them Native Americans. I chose to go with Native Americans because I feel that it honestly is the correct term. While I grew up hearing the term “Pilgrims & Indians” around Thanksgiving, I don’t feel it is accurate. I want to teach my so to use the correct term, so I felt it was important to do so her as well. Making this fun craft sticks craft is just another great way to incorporate learning and playtime. I am a firm believer that kids will learn and retain information longer if it is fun for them. 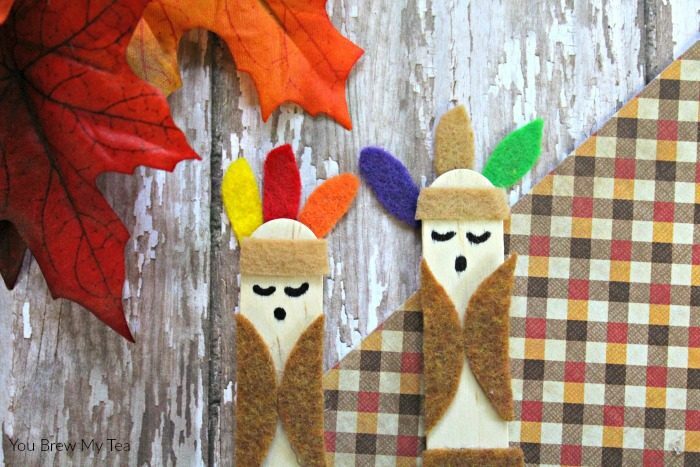 By creating these Native American dolls using wooden craft sticks, you give your kids a fun craft that also allows them to learn and retain information. Are you looking for more homeschool support? Come join our Homeschooling Lazy Parent Style group today! This would be such a fun craft for the kids table during Thanksgiving. Thanks for sharing on Merry Monday. Pinned. Love these! Such a fun kids craft idea. Thanks for sharing your crafty goodness on the Monday Funday Party!